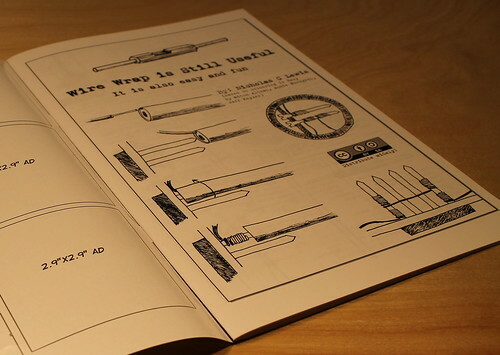 We strongly recommend reading through the “Wire Wrap is Still Useful” comic before beginning. 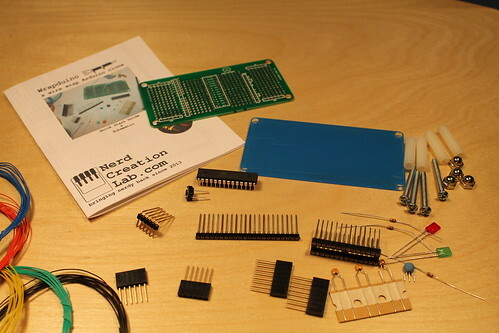 Now begin placing the components. 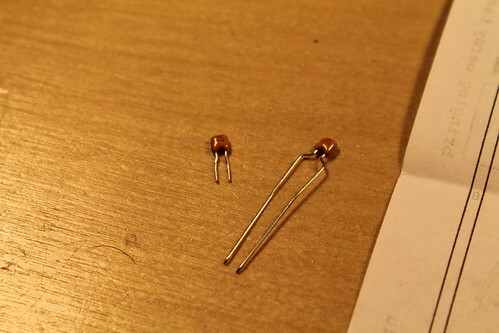 It is best to start by placing the female headers and the DIP socket. 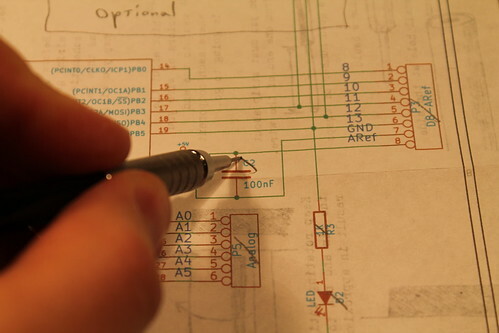 As you add components it is a good idea to check them off on your schematic so that you keep track of your progress. 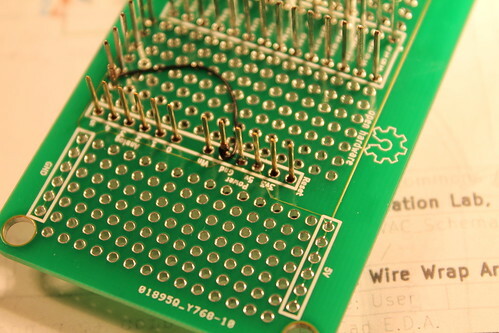 You should then add the FTDI header (6pin male header). 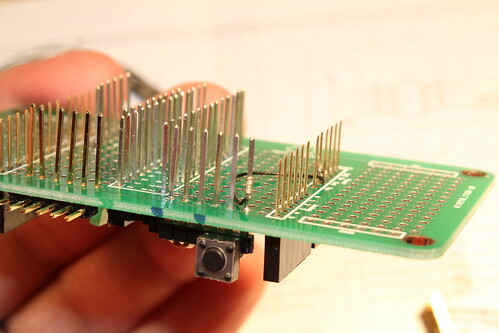 We recommend you bend the longer pins over 90° so the connector is flush with the board but you can leave them vertical if you want. Most of the components you have added will be loose. 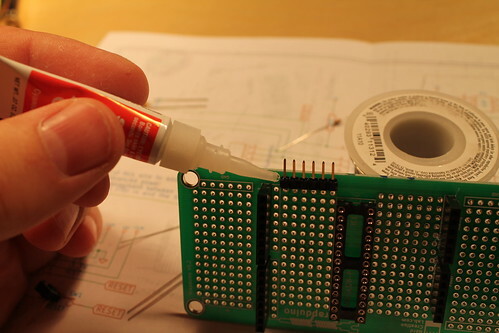 You can glue them in with super glue or hot glue. 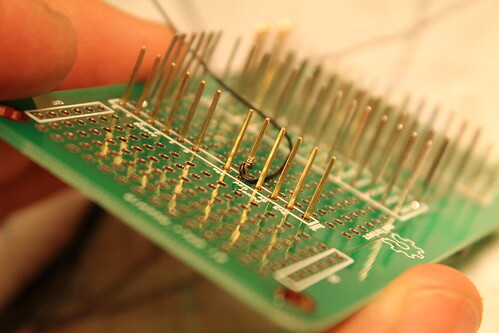 Or if you would rather you can tack solder a few of the pins to the perf board. 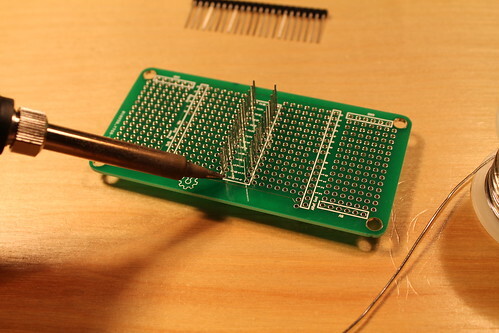 But it is nice to do it with out any solder. 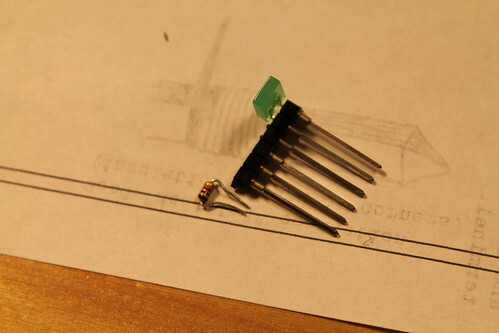 The next step is to decide where the rest of the components are going to go. We recommend the following arrangement as it optimizes the wire runs and leaves space for additional components. 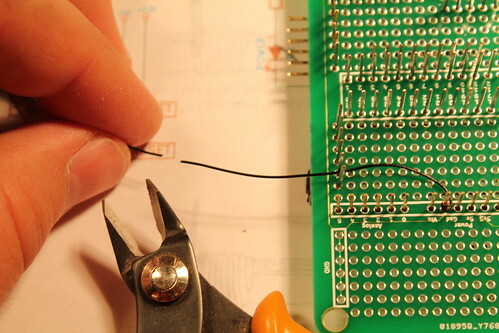 Start by bending and clipping the leads to the length shown. The leads should go all the way into the sockets. Don’t cut them too short to start with as you can always trim more later. 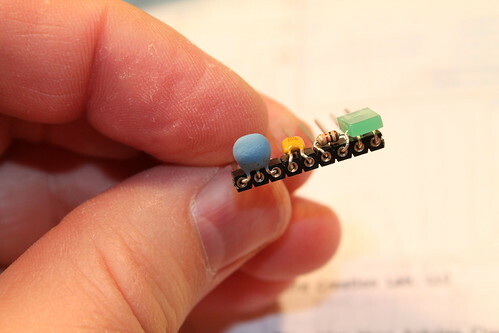 As you continue adding components be sure to check them off on your schematic. 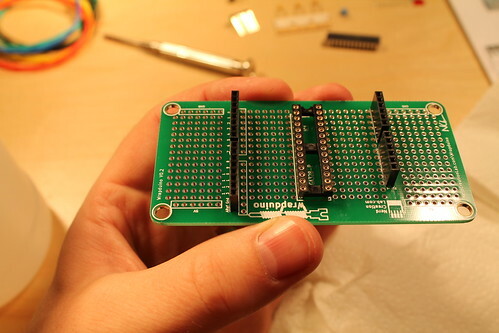 Once again, if you want to hold the sockets to the board as you go you can glue or tack solder them. 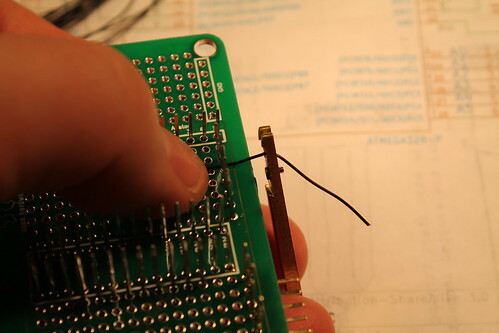 This is optional as once you start wrapping the wires will hold them in place. 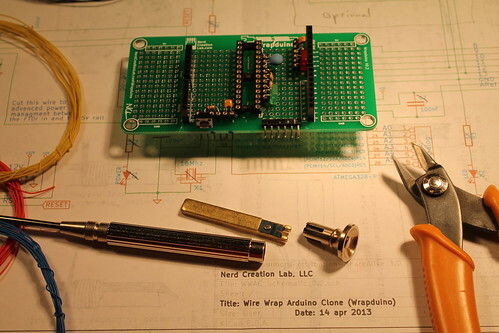 Now that all the components and sockets are placed gather you wire, wire cutters, and wire wrap tool. Then you should start deciding what color wire you want to use where. 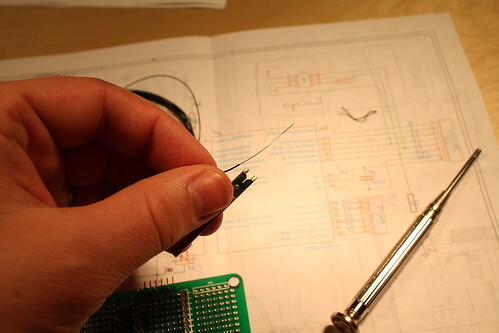 The recommended coloring scheme is to use black for all your ground wires and red for the +5v wires. Then use a combination of the blue, yellow, and green for the rest. 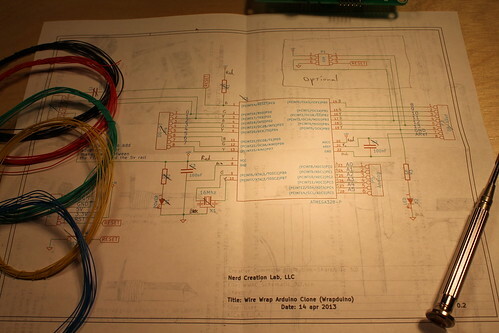 You can go over your schematic and mark what color each wire will be. The image below shows alternating blue, green, yellow, blue, green, yellow, etc… for all the remaining pins. 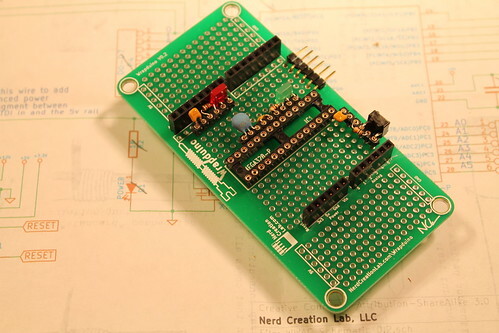 You could also make all the analog pins one color, D0-D7 another, and D8-Aref the third. 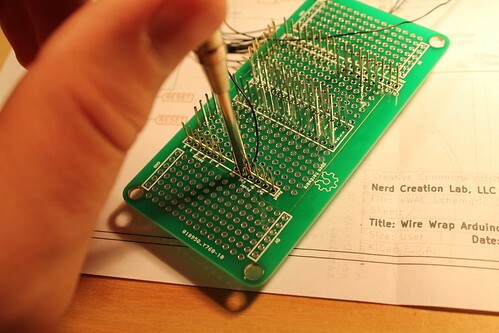 Take your wire and strip approx. 3/4″ of insulation from one end. 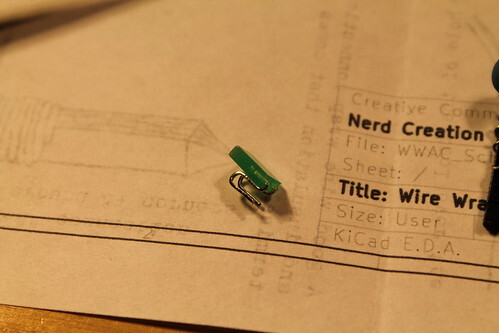 (There should be a simple stripper on or in your wire wrap tool). 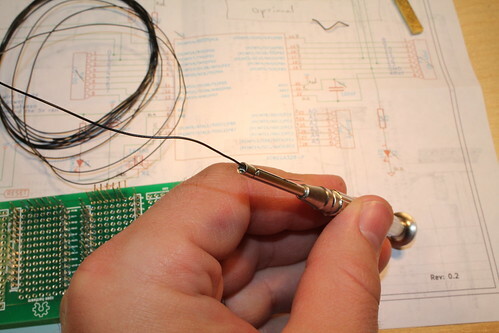 Now insert the stripped wire into the small outer hole in end of the wire wrap tool. 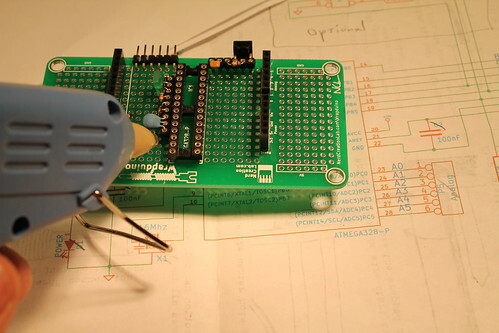 Then slip the tool over the terminal. 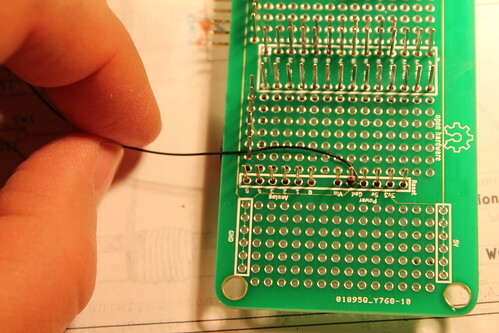 Now route the wire around any other pins and leave some extra slack. Then cut (leaving enough length for the wrap). Continue this process for each connection. 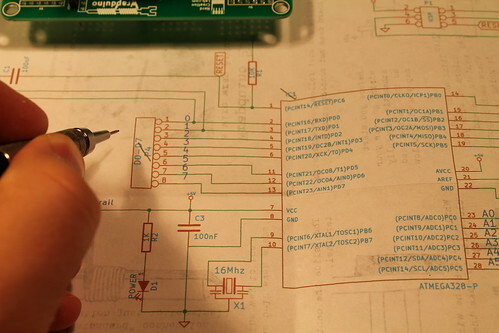 Check them off on your schematic as you go so that you do not forget any of them. Additional photos of progress and complete assembly to be added. Also pictures of base plate installation to be added.